A couple of gates finally opened. One was the same one I had been kicked off of twice which I told them not to send me to again. That actually worked out well because they were able to get a guard who had done that gate before, was very familiar with it, and liked it. I took the other gate south near Cotulla, TX. I left the campground early in the morning and drove down following only some general directions until I got stopped by a flag man for road work. I knew I was very close to the gate and would have to drive slow to find it so as soon as the pilot car came back for us, I pulled over to the side to let everyone else pass to keep from slowing them down. The last person to pass me was my support guy with my support trailer. LOL! He spotted me and waited for me to pull out behind him. He guided me right to the gate nearby. Unfortunately, the previous guard I was replacing had not gotten ready to leave yet so I had to pull over to the side and wait for a couple hours. He had been there for 3 years so he had a lot to get ready. The tires on his trailer were flat, he didn’t have the bar to crank up his jacks, and he didn’t have a truck to tow the trailer. I loaned him my tools to take care of most of the issues while we waited for his cousin to come with a truck. Once the previous guard left, I drove up to the first drill pad to turn around and then pulled into the guard space and started setting up. Naturally, I was a bit gun shy by now so it took a week before I really started to relax and pull things out to fully settle in. The traffic here is pretty slow. They’re just monitoring gauges and pulling out oil in tankers so not many vehicles coming in. Sometimes I get a few water trucks. I get woke up at least once every night, sometimes more, but I still get plenty of sleep. Crossing my fingers that this will be a long gate. As soon as I felt comfortable, I cleaned up the trash in the area and cut down all the crap growing up through the cattle guard. 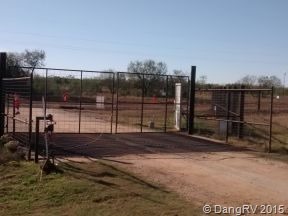 I have to walk a long cattle guard to open and close the gate which is hard enough without getting tripped by that stuff or wondering what is hiding in it. I rigged up a rope to help me open half the gate and walk the cattle guard less. At least the gate is right next to the highway and across the street from 4 other gates with guards on them. Their gates are very busy at all times so I’m glad to be over on this other ranch. 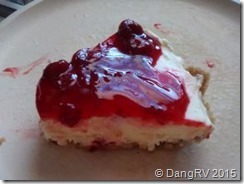 To celebrate, I made Jell-O brand cheese cake that comes almost completely from a box. I had my doubts as to how good it would be but had to try it since it didn’t require much extra added so it would be a perfect dessert to keep on board. I was very surprised. It was delicious! The texture came out perfect too and it was very fast to make. As you can see, only one piece managed to survive for a picture and that was short-lived. This is a good dessert to take to pot lucks. I altered it to use fat free milk (not powdered), Olivio (1/3 fewer calories) instead of margarine or butter, and Stevia instead of sugar. Now that doesn’t make it low calorie but it does make it lower. Every little bit helps!